Adorable little girl booties for tiny pampered paws! These booties slip right on, stay on and will even fit a tiny Yorkie. 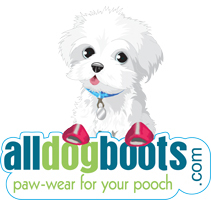 Finally a dog bootie made for a small breed dog! These booties are great for your little girl to wear at the beach on hot pavement or sand. Ideal to wear indoors after surgery, to prevent continual licking due to allergies or to add more traction on slippery floors. Also keeps paws warm and cozy on a cold winter day. 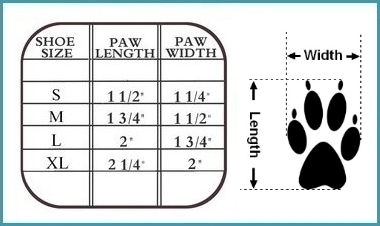 STEP 1: Using a ruler measure the length of your dog's paw from the back of the base pad to the end of the nails. Measure the width. I have a 6 pound Maltese, been looking for shoes everywhere, either they are too pricey or too big. I just really want them for when snow and salt is on the ground and when pavement is hot. Once I ordered them they arrived in 4 days, I used them for the first time today, we walked two full blocks and not one flew off and Daisy walked very nice in them almost like she wanted them on her feet. got home, feet were a little wet but not much as they are part mesh but her pads were clean !!! They kept the ice and salt off!! I am so happy with these boots !!! Also I must add, I called in this order and the customer service was great ! Very easy to put on. Velcro straps are great. Thank you! Our second dog is a Papillon In Arizona, it heats up to 105-110 in June. I walk her in the early morning. It's funny to watch her walk in her booties with her tiny feet. Thank you! It's really just a matter of having the right size. When my dog gets a haircut, she needs smalls. When her hair grows in, she needs mediums. But when she wears the right size, these fit and stay on very well. They are soft, and get softer when worn in a little. They will take a beating if you live in an urban area, but are relatively inexpensive for the use you will get out of them. They also hold up well for a few rounds in the washer/dryer. Easy to get on with a wide opening to step in. Flexible sole, so no tripping. They are quite short. So far no slippage, but we haven't been on a long walk yet. Got these to protect from icemelt, fertilizers and hot or cold sidewalks. Great starter booties.